Is the omega-6 to omega-3 ratio related to executive function in 7- to 12-year olds? We have a cool new task: the Electric Maze. Some of you had the chance to try out the maze in a recent study. I hope everyone had fun. We have now looked at the data. As it turns out, the Electric Maze Task (EMT) works very well as a measure of planning, which is exactly what we were trying to do. So, yay! First, what is planning? Planning is a complex cognitive function that we use every day to think through what we need to do that day or in the next few hours. Some things, like coordinating family schedules so that everyone gets where they need to be on time or mapping out long-term projects at work so deadlines are met, take careful planning. We don’t have full-on planning abilities until we are adults, but planning abilities are developing in childhood. Development begins with the basics like the ability to hold several items in mind and the ability to focus without getting distracted by unneeded information. Have you ever gone to the grocery store for eggs but come home with milk and chocolate and peas, but no eggs? (I hope that’s not just me!) Our goal was to create a new task that encouraged participants to plan how they were going to solve a problem (in this case, getting through the maze) and that we could change in different ways to test these developing parts of planning. Of course, we wanted to create a task that was fun. Second, what is the EMT? 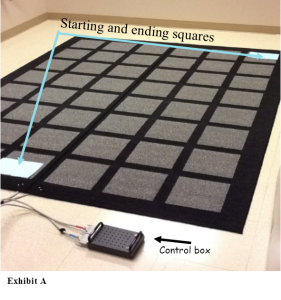 The EMT uses a 6’ x 8’ mat of gray squares that is connected to a control box (see Exhibit A). Each square has a sensor beneath it that beeps if someone steps on it. We turn off the sensors by placing a peg in the corresponding hole of the control box, thereby creating paths that don’t beep. Participants are asked to find the correct (non-beeping) path through the maze (planning) by remembering and avoiding squares that have beeped (working memory). To make it easier, we marked the beginning and end. 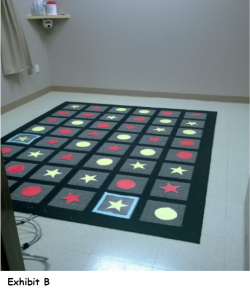 To make it more difficult, we placed red and yellow stars and circles all over the maze (see Exhibit B), and participants played either the color game or the shape game. In the color game, the correct squares were all one color (either red or yellow). In the shape game, the correct squares were all one shape (either stars or circles). The participants solved two color-game paths and two shape-game paths. Switching from one game to another is difficult because you r brain is used to using a rule, but you have to stop, for example, stepping on red squares and step only on circles. Third, what did we find? Well, we found that results from the EMT were related to commonly used measures of planning and working memory in children 7-12 years old. We also found that brain activity related to better performance on those commonly used planning tasks was related to better performance on the EMT. These results proved that the EMT provided a new and exciting way to measure planning development. Importantly, we found that omega-3 fatty acid intake and the omega-6 to omega-3 fatty acid ratio were related to performance on the EMT. Children with lower ratios (who were thus, eating fewer omega-6 foods) and greater omega-3 intake solved the mazes faster and made fewer errors on the 8-step (i.e., more difficult) mazes. Since this was our first study with a brand new task, these results are very exciting. We will be working on expanding our results to older and younger children, and we are hoping to learn even more with the EMT. By using the rule-switching game, we tested out just one thing we can do with the Electric Maze Task. There are a lot of other fun games we could play, and we are excited to try some of these new ideas out soon.